Image: Top from left Alec Finch, Keely Dalfen and partners, bottom left Russ Meehan auctioned artwork, bottom right Childline Ball underway! 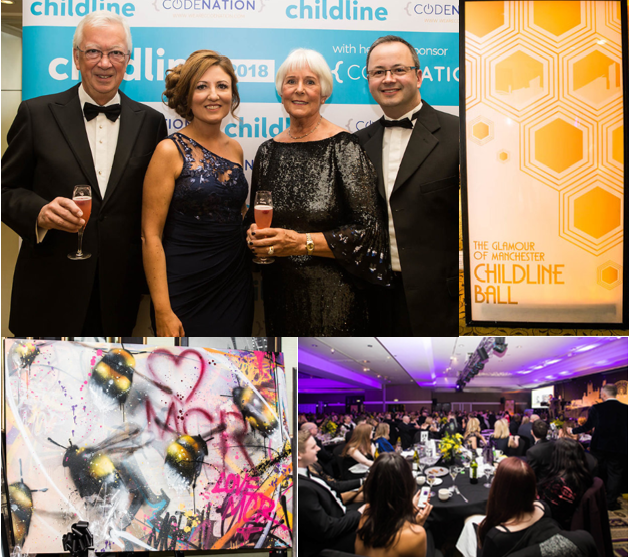 On the 3rd March 2018, hundreds gathered to dance the night away at the Midland Hotel in Manchester for Childline’s biggest fundraiser in the North West. For the last two years AFL’s CFO, Keely Dalfen, has been Treasurer of the North West Ball Steering Committee. Keely, and all of the organisers of the event, were bowled over by the generosity of all those who attended, and would like to thank everyone involved. The event was opened by Andy Lord, from lead sponsor Code Nation, and Key 2 Radio’s Darren Proctor was the compere for the evening. Guests at the event also heard from Sir Howard Bernstein, former chief executive of Manchester City Council, and Mathew Bennett, who has completed some amazing fundraising challenges for the NSPCC, including trekking the Gobi desert and rowing the Atlantic ocean as part of a five man team. Planning for the 2019 ball has already begun with the hope to raise over £200,000.00 this year. AFL are very proud to announce Steve Vickers, Managing Director, Corporate, will be joining Keely Dalfen on this year’s Steering committee.